Great build quality, two memory card slots, good picture viewer, touchscreen actually works! The Sony Reader Touch Edition (PRS-650) is a handsomely crafted eBook reader that impresses on almost every level. However, with no Wi-Fi or bundled accessories, it's perhaps a teensy bit overpriced (Australian RRP: $299). 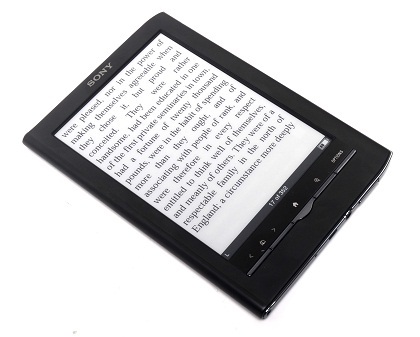 As its name suggests, the Sony Reader Touch Edition (PRS-650) eBook reader comes with a touchscreen in the form of a six-inch, 16-level greyscale e-ink display (a cheaper 5in version is also available). The Sony Reader’s touchscreen can be manipulated with your fingertip or the included stylus, which slips snugly into the side of the device. 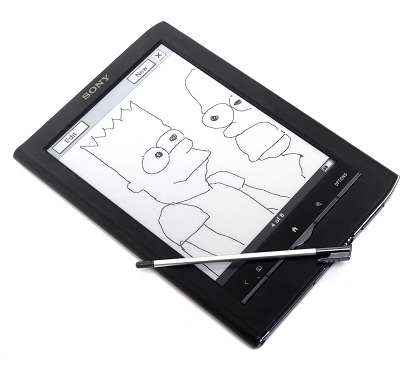 In addition to reading eBooks, viewing black-and-white photos and listening to music, the Sony Reader Touch Edition (PRS-650) doubles as a digital notepad for drawing and writing notes. File format support is good, including BBeB, PDFs, Microsoft Word and the ubiquitous ePub standard. With an RRP of $299, the Sony Reader Touch Edition is a bit pricey compared to other eBook readers on the market — especially considering it lacks Wi-Fi or 3G connectivity. Nonetheless, it remains a worthy and stylish option for discerning (digital) book worms. In terms of design, the Sony Reader Touch Edition (PRS-650) is almost identical to its predecessor, the Reader Touch Edition PRS-600. Everything from screen size to the button layout remains more or less unchanged. Fortunately, the PRS-600 was one of the most stylish eBooks on the market, so we're not particularly fussed by the lack of a makeover. 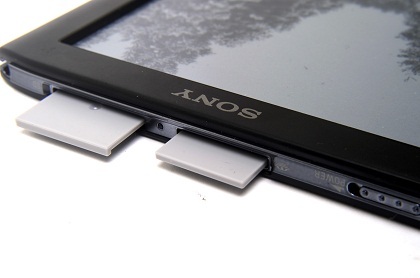 With dimensions of 118x168x9.6mm, the Sony Reader Touch Edition (PRS-650) is quite compact for a 6in eBook reader. The version we tested came with a black metal finish; a red model is also available for trendier readers. The eBook reader has five buttons along the bottom of the screen. These consist of page-turn (forwards and back), home menu, zoom (for different-sized fonts) and a context-sensitive 'options' button. Naturally, the majority of functions are accessed via the Reader's touchscreen, which includes an on-screen QWERTY keyboard. We found text input to be reasonably fast and responsive, although people with thick fingers will be relegated to the stylus. We were very impressed with the PRS-650's touchscreen. Like the Apple iPhone, pages and images can be scrolled through by flicking your finger across the screen. Sadly, you don't get that cool 'sliding' effect like on Apple products, but it still gets the job done pretty well. That said, we found ourselves using the page-scroll buttons at the bottom of the screen more often than not; it meant we didn't have to keep obscuring the screen with our hand. This is the best we could muster. Sorry. The Sony Reader Touch Edition (PRS-650) is pretty miserly when it comes to bundled extras. You only get one public domain book (Pride & Prejudice); compared to 1500 on the Kogan eBook Reader. We realise that these books can be downloaded for free, but would it have killed Sony to go to a bit of effort on our behalf? Annoyingly, Sony has also failed to provide a slipcase, which means you'll need to take care when tossing the Reader inside your bag. (You can purchase a protective cover from Sony for $45, but seriously; what's that about?) On the plus side, the Oxford Dictionary is included on the device, free of charge. 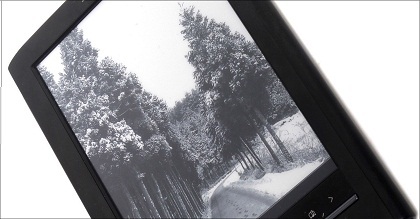 As mentioned previously, the Sony Reader Touch Edition (PRS-650) does not come with Wi-Fi or 3G capabilities (features offered by the two new Kindle 3 models). This means you're forced to connect the device to a computer whenever you want to download books or other media (a USB cable and inbuilt eBook Library software are both included).